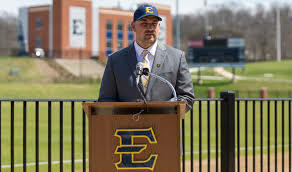 Welcome to the official site of the Bucs Soccer Academy, LLC located on the campus of East Tennessee State University! Head Coach David Casper and the ETSU Soccer Camp Staff invite you to join us for a great training experience. Bucs Soccer Academy, LLC is geared toward players who are seeking an opportunity to elevate their soccer skills to the next level. Our Elite Residential Camp is offered for boys only, ages 12+ and every level of player, whether you are hoping to make your travel team, or looking to play college soccer. Summer Camps are both developmental and ID. The BSA Day Camp is for boys, ages 5-14, who are learning to play and love the game of soccer. Day Camp is organized with the same level of excellence and detail as our overnight camps, but with activities and an environment more appropriate for the developmental player who’s learning the game. Our goal is to keep growing the ETSU soccer family by valuing relationships with everyone in our community and surrounding us by creating a learning environment for everyone involved in soccer at all levels. We will be looking to grow the Bucs Soccer Academy, LLC from year to year so please keep checking our camp website for new implemented events. Please take the time to look through our website for all of your camp information and to learn about the Bucs Soccer Academy, LLC.